Linting is the term used to describe the process of running software that will analyse your source code quality, compliance with coding standards and much more. 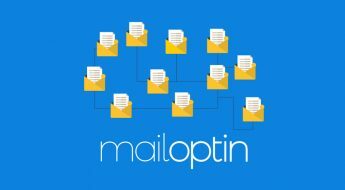 Why is Linting it important? I like to think of linters as being a bit like a spellchecker on steroids for anyone who spends a lot of time looking at code. Even the best coders in the world make mistakes and a good linting setup goes a long way to catching silly mistakes before they sneak into production. help you to ensure you write code in a consistent manner. This is really important whether you’re a one man band or a 50 strong development team. (But particularly useful on large development teams). improve code quality and readability. WordPress now powers over 31% of the web and has thousands of people contributing code from every corner of the planet. The wider WordPress ecosystem including plugin authors, theme designers and power users stretches out even further. Can you imagine how many different coding styles there must be across that ecosystem? If we let every developer apply their personality to the WordPress project we’d end up with an inconsistent, unreadable Frankenstein’s monster. That’s where the WordPress Coding Standards come in. These coding standards allow the community to collaborate in a consistent manner. 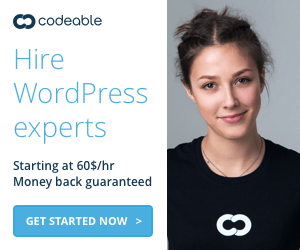 For the most part, WordPress it helps to ensure that the core of WordPress looks like it was written by a single person. 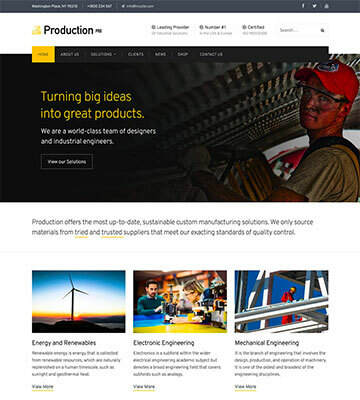 If you’ve spent time contributing to WordPress or making your own themes and plugins you’ll most likely be familiar with many of these standards simply through seeing them time and time again. But even if you’ve studied the standards inside and out, it’s very easy to lose sight of them in the heat of the hunt. And that’s why our linters are so important. When we configure our linters to enforce the WordPress Coding Standards, we end up with an extremely powerful automated QA ally sitting on our shoulder as we go about our work. 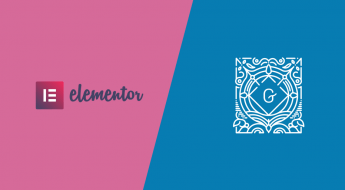 The purpose of this post is to walk you through the process of configuring your development environment with a wicked smart, WordPress optimized, set of Linters. By the time we’re done you’ll wonder how you ever lived without them! Before we dive into the nitty gritty of each Linter, we need to get some basic things up and running. My development machine is running on macOS but most of the steps below carry across to Linux and Windows environments but YMMV! If you get a blank line you’ll need to go ahead and install PHP. This will launch the PEAR install process. 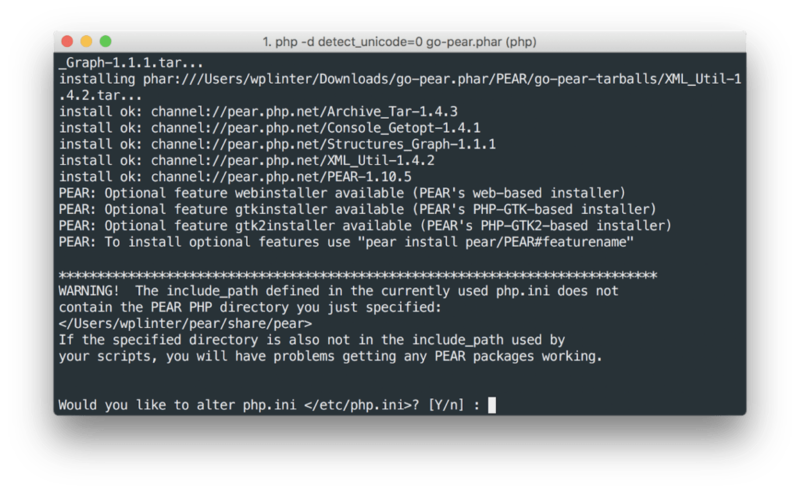 NOTE: If you see permissions errors/warnings after running the command above and going through the steps below you may have attempted to install PEAR from a system location that wouldn’t typically have permissions to do so – which you really shouldn’t do. 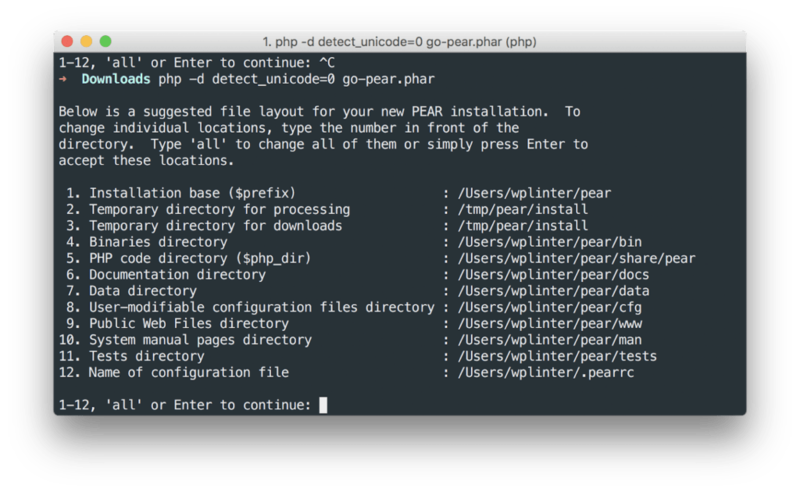 If you’ve no other choice you can try running sudo php -d detect_unicode=0 go-pear.phar instead – but I recommend avoiding that if possible. If you see /Users/myuseraccount in the path recommendations you’re on to a winner. Hit Enter to continue. This will complete the install. You may be prompted to update your PHP include path. Enter Y to complete the php.ini update. If you’re not prompted to update your include_path, see instructions below. Finally, you can confirm you’re all set with PEAR as follows. Ok that’s PEAR all sorted, let’s move on! The only downside to using NVM for managing node is that many Editor packages make poor assumptions about where Node is installed. For that reason, we’re going to create a symlink which should resolve those kind of assumptions. NOTE: Make sure to adjust your symlink to reflect your Node path. For Windows check out this install guide. Many of the steps here transfer nicely to VS Code and we’ll be circling back to using our Linter setup with VS Code in a separate blog post in the future. Ok that’s all the basics sorted, let’s get our PHP Linter up and running! PHP_CodeSniffer is the workhorse for our PHP Linting setup. It’s actually 2 separate scripts. NOTE: Don’t worry if your path is different to mine (in fact yours should be different!). ‘Sniffs’ are basically coding standards config rules for phpcs. Thankfully there is a wonderful set of sniffs available for the WordPress PHP Coding Standards. To install these, I recommend the Standalone installation method. Create a directory somewhere safe on your machine like ~/DEV/WPDEV/ and open a terminal session from inside that directory. The final step is to set the WordPress rules to be the default global rules that phpcs uses. Congrats! You’ve now got phpcs configured correctly for WordPress projects! Now let’s hook it up to Sublime Text so we can actually see it in action in our editor. SublimeLinter is going to be the framework via which many of our linters will run. 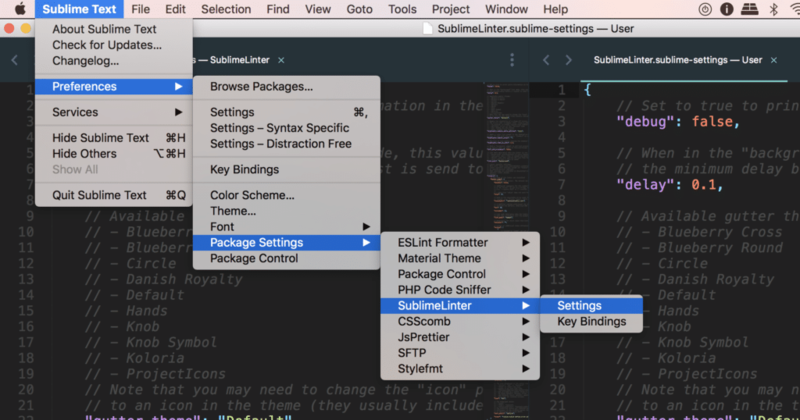 Go ahead and install Sublime Linter via Package Control. While sublime-phpcs has been deprecated it still works perfectly fine me. If you wish, you can install SublimeLinter-phpcs as an alternative. (I have both installed). 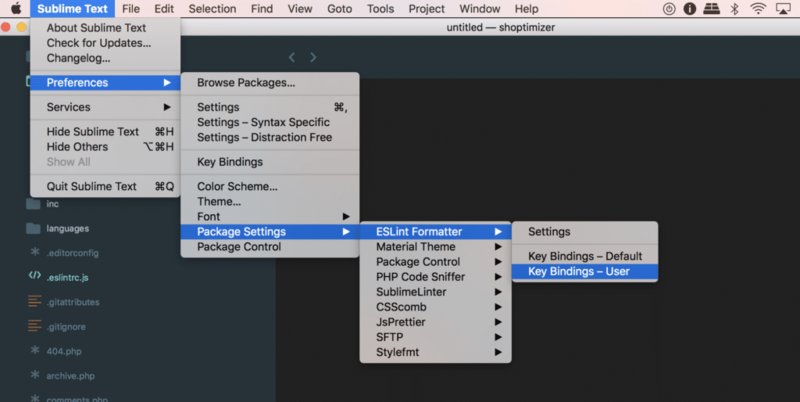 Use Sublime Text’s Package Control (Preferences -> Package Control -> Install Package -> phpcs) to install this plugin. If your user settings are blank, you can copy them from Settings – Default, or, grab a copy of my phpcs user settings over on Github. NOTE: If you use my settings as a starting point for your own, please make sure to update phpcs_executable_path to point to your phpcs path. phpcs_execute_on_save – We’ve set this to true which will execute phpcs each time you save your file. You can grab my settings from Github. Again, don’t forget to update all paths to match your environment. The really important paths are in the main linters config. You’ll need to update those paths to match where your node path is. If you’ve installed Node.js globally it might live in /usr/local/bin/node so you would use /usr/local/bin as the path below. (ESLint will then find node inside that directory). (Sidenote: we’ll come back to the Stylelint and ESLint stuff a bit later). By setting up SublimeLinter phpcs settings in this manner it means our Linters will run globally in Sublime Text, which is actually what I want as WordPress is all we do 🙂 But if you prefer more granular control over your linting config, you can define a phpcs.xml file which should live in the root of your theme or plugin. You can also use a project specific phpcs.xml file in tandem with the global settings. The phpcs.xml rules will override your global config. Here’s an example phpcs.xml file for one of our projects. We’re almost ready to test out our PHP Linter! Just before we do, a very useful asset to include in your project is a .editorconfig file. While not as strict as a dedicated Linter, it helps to inform your editor of choice on what syntax conventions your project should use. Grab our .editorconfig file and drop it into your project root. See your PHP Linter in action! Ok so to see your PHP Linter in action simply relaunch Sublime Text and open a PHP file from your WordPress project. With the Linter config we’ve implemented, the Linter will automatically run when you open any PHP file. Unless you’re some sort of natural PHP ninja, the Linter is almost guaranteed to find something it doesn’t like. But just in case, I’ve prepared something appropriately awful for our Linter to complain about – and do it’s best to fix! 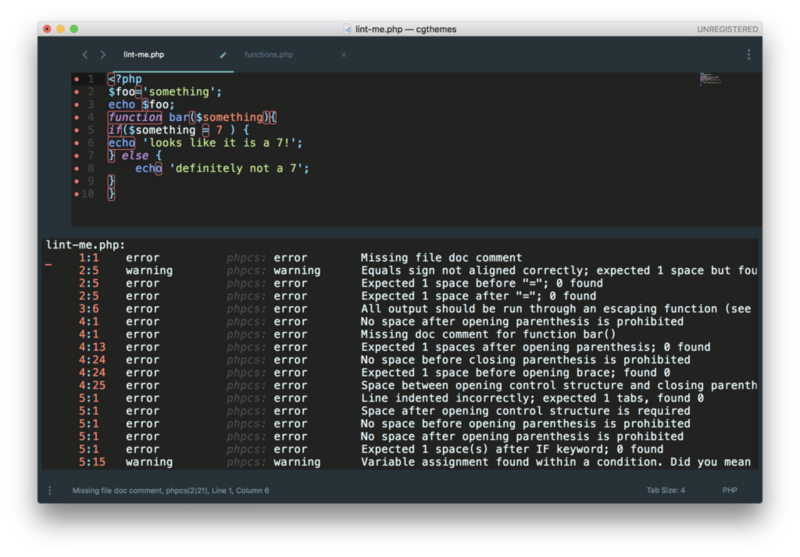 NOTE: If you’d like to see a summary of all your errors/warnings at the bottom of the screen like in the screenshot above simply open the console in Sublime Text. That’s an impressive number of errors for a 10 line php file 🙂 If you hover over any of the red dots you’ll see the detail of what the Linter found. For example, hovering over line 5 gives us 1 warning and 6 errors. As we’ve configured phpbcf to run upon save, simply saving this file will instantly fix 15 of the errors! Here’s a copy of the same file that I’ve now cleaned up and which passes our WordPress sniffs. And that’s our PHP Linter fully setup and integrated with Sublime Text. Don’t forget you can also deploy your sniffs in lots of different ways – not just within your text editor. Many teams choose to run their code through Linters as part of their code commits using Travis CI or Jenkins. Another great way to use phpcs is via a Gulp task. My personal preference is to catch things early in Sublime Text or simply via the terminal. The good news is that if you’ve already done all the hard work in Steps 1 and 2, this step is a doddle 🙂 If not, get back up to Steps 1 and 2 before proceeding! This will add both packages to your package.json file. To avoid having to hardcode absolute paths to global NPM package locations, I would recommend installing your NPM packages locally. Next, we’ll install the SublimeLinter ESLint Package via Package Control just like we did with our earlier Sublime packages. If you recall earlier, we added the following to our SublimeLinter settings. That basically means we’ve already configured SublimeLinter to work with ESLint. Paying it forward FTW! See your JS Linter in action! 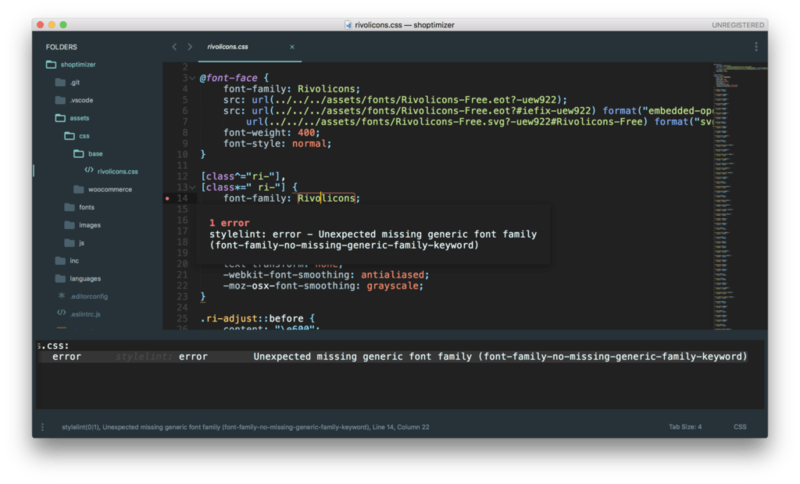 As before, SublimeLinter will use your Linter config to highlight in your editor any code standards violations. Go ahead and open any of your WordPress project js files. Here’s an example of an error in one of my files. There’s no equivalent of phpbcf built into ESLint directly, but we do have the wonderful ESLint Formatter Sublime Text Package which does an awesome job at reading our .eslintrc.js and autofixing a ton of violations. 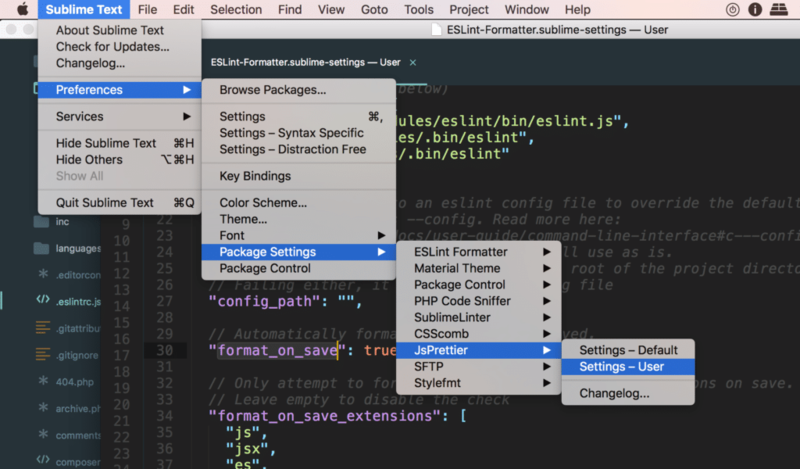 Go ahead and install the package and then head over to the ESLint Formatter settings. As before, I’ve uploaded a copy of my settings to Github. Again, the main things to watch out for are your Node.js paths and the path to your ESLint install. (And watch those paths! Unlike SublimeLinter, ESLint Formatter expects the FULL path to both Node and ESLint as shown in my sample config). You’ll also notice that the formatter will run on save just like our phpbcf config. ESLint Formatter will automatically look for your .eslintrc.js config so no need to explicitly reference it. If anything ESLint Formatter does a better job at autofixing standards violations. We’re now on to the final Step in our WordPress Linter setup! We’re going to install our main Style Linter, aptly named stylelint 🙂 Again there are tons of Linters for CSS/Sass/Less/CSSNext, but stylelint for me is the pick of the bunch. It’s made by the same people who make ESLint – and that’s enough for me. If you’ve adopted SASS as your CSS pre-compiler you’ll want to check out sass-lint instead of stylelint. Good news, this is the last Sublime Package you’ll need to install in this guide! Head over to Package Control and install it as normal. If so, you’re good to go! Your last step to get your CSS Linter up and running is to add a config file for stylelint to read. 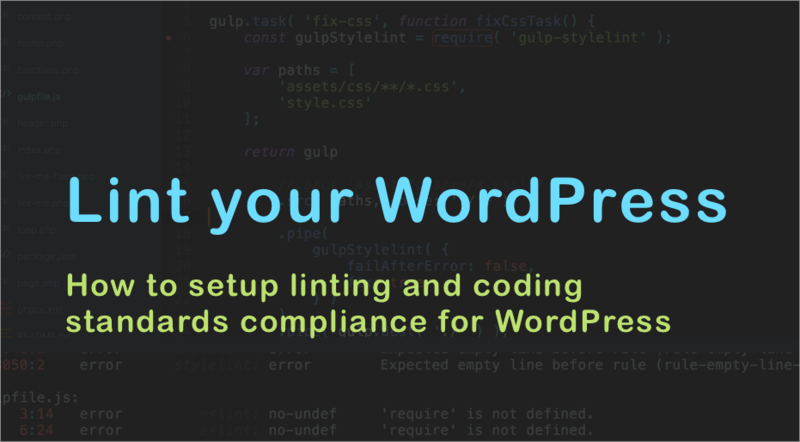 This config file tells stylelint to load the WordPress ruleset, which is then extended to include rules for the ordering of properties which are not currently included in the main WordPress ruleset we installed earlier. NOTE: If you’ve installed stylelint-config-wordpress and stylelint-order globally, you’ll need to ensure that the path in your stylelint.config.js file is the full absolute path to the package (i.e. something like /usr/local/lib/node_modules/stylelint-config-wordpress). If you’ve installed stylelint-config-wordpress and stylelint-order locally then the path included in our sample config is fine. See your CSS Linter in action! Just like our PHP and JS Linters, your CSS Linter should now run automatically when you open any of your CSS files in your WordPress project. Prettier has taken the code formatting world by storm (if such a thing is possible!) since it first appeared in 2017. 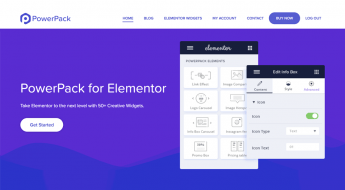 It has quickly been adopted by many modern frontend frameworks as the formatter of choice. But it’s greatest strength “it just works!” is also the cause of one of it’s biggest weaknesses – it is VERY opinionated. That would be fine if those opinions lined up nicely with the WordPress CSS Coding Standards – but alas, they don’t. Nevertheless, Prettier is so damn effective at formatting CSS files, we can’t ignore it. So we’re going to use it to catch most code formatting issues in our projects, and THEN we’ll run a stylelint --fix operation to bring things in line with our WordPress CSS Coding Standards. (Sidenote: Pupils at the top of the class might notice that Automattic actually maintain a fork of Prettier for the Calypso projects that brings Prettier in line with the WordPress coding standards. While that is the case it didn’t work very well for me when it comes to CSS code formatting (i.e. it replaced all double quotes with single quotes which is the opposite of what is in the WP CSS Standards), so I believe the Automattic fork is more concerned with JS formatting). 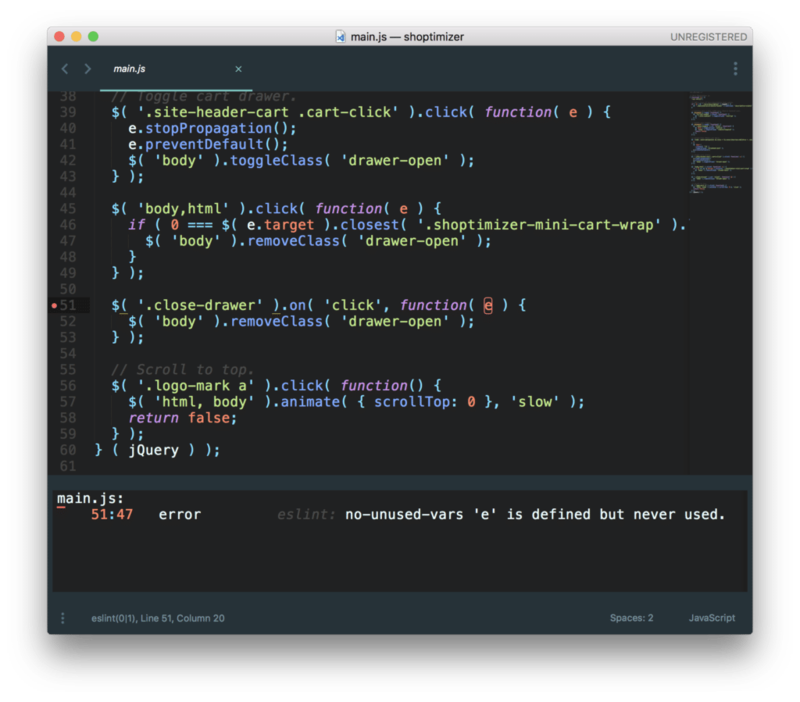 To complement the Node package we also install the Prettier Sublime Text Package. auto_format_on_save – this is set to false. You’ll recall with our previous fixers we’ve always set to them to true so that they run instantly each time we save a file. We’ve elected NOT to do that for Prettier and we’ll see why now. Prettier + stylelint –fix = CSS Autofixing Dream Tag Team! 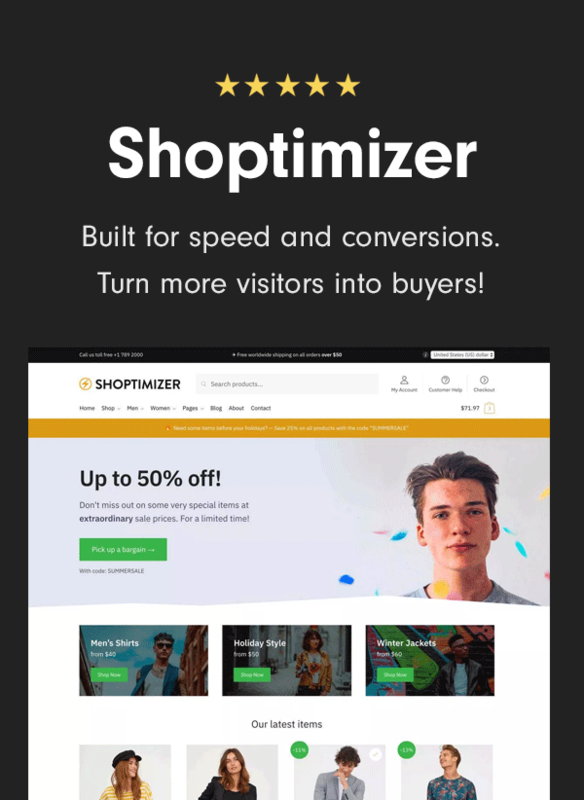 After spending a ton of time experimenting with different autofixing workflows and settling on the combo of Prettier and stylelint –fix, I discovered Chris over CSS Tricks came to the same conclusion. Step 1: Open CSS file, let stylelint do it’s thing to tell you how many errors your CSS has. Neither Prettier or stylelint on their own are good enough to do a really good job autofixing and formatting our CSS. But with their powers combined they end up doing a seriously good job at fixing your CSS. Prettier will do a really good job at removing a lot of the crap from your messier CSS files. But it won’t autofix WordPress specific rules like the use of Tabs vs. Spaces and other WP specific rules – which is why we need stylelint --fix to come behind Prettier to catch and enforce things Prettier misses or simply doesn’t care about. run it via Gulp task. Running it via a Gulp task is awesome as you can create a watch task in Gulp which can run straight after you’ve run Prettier. First, you’ll need to install a few more Node.js packages. NOTE: You’ll want to tweak the paths to your CSS files to match with your project. All going well, you should see something like this. For now, I’m happy to run both formatters manually when I need them. But I could just as easily create a Gulp watch task to trigger the fix-css task any time my CSS files are saved. And that’s your CSS Linter and Autofixer workflow setup 100% complete! Now you can sit back and marvel at how beautiful your CSS looks 🙂 Remember the formatters and autofixers won’t solve everything. You should still go through your CSS files manually and manually fix other issues detected by stylelint. If you’ve made it this far give yourself a massive pat on the back! 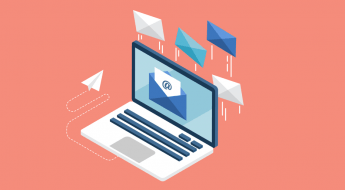 It’s sometimes difficult to justify taking the time to improve your development workflow but getting a reliable set of Linters up and running for your projects is one of the best investments you can make in your WordPress software development processes. The obvious area we only skimmed over today was SASS and Linting for CSS Pre-processors. In fact, if you’re already a heavy SASS user, you may not be too concerned about Linting your CSS, but, for me that would be a mistake. Many WordPress projects inherit standalone CSS files from other sources that should be subject to the same level of code quality we apply to everything else. We plan on revisiting SASS Linters in the near future. But for now, it’s time for you to get stuck into using your new arsenal of toys to significantly improve your code quality. As always, feel free to ask us any questions in the comments below. Colm has been building web stuff since the web was a wee lad. Colm built his first blog with WordPress around 2007 and has been hooked ever since. When not knee deep in hooks and filters you'll probably find him running around a mountain or making pizza.